Today I’m pleased to announce the immediate availability of Black Ink 1.0. Read more in the Press Release. Hopefully the icon makes it pretty obvious that this is an application for solving crossword puzzles. 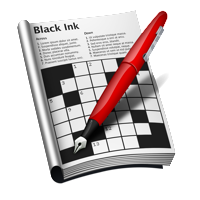 In fact, Black Ink is the successor to the most popular crossword solving application on Mac OS X: MacXword, formerly available from Advenio, LLC. Fully compatible with Intel-based Macs. Ported from Java to Objective-C and fine-tuned for performance. Streamlined UI emphasises finding and solving puzzles. If you love crosswords, and you have a Mac, you need to check out Black Ink. If you love crosswords and you don’t have a Mac, maybe it’s finally time to change that. Update: Stephan Cleaves offers a good historical perspective on MacXword, and how it ended up becoming Black Ink. This entry was posted to Black Ink, Business, Red Sweater News. Both comments and pings are currently closed. Thanks for reading! I’m so happy to see MacXword live on as Black Ink and I know the existing users of MacXword will be especially pleased to have a universal binary. New users should be drawn by the improvements to the user experience you have implemented and by whatever great features you add in the future. Thanks for making this a wonderful transaction and for the excellent work you’ve done on this first new version. I’m composing a brief history of MacXword that will be posted to the Yellow Camp blog – http://yellow-camp.com/blog/ – sometime later today. Congrats Daniel! You are turning into a quiet software powerhouse along the lines of Adobe or M$FT – except with out the bloat and malware, LMAO!!!! Seriously, it’s nice to see someone building up a nice foundation on some solid Mac software. Continued blessings and success to you. Neat, I never would have guessed! Glad to see such a fun app added to your product line. Congratulations, and a special thanks for showing us how you handled the transition. Nice work Dan! Who did the work on that icon? Thanks, Devon! The icon is by Jordan Langille of One Toad Design. Whoa, as a crossword geek I am VERY excited! This strikes me as a perfect small-app acquisition for Red Sweater, and I’m delighted to see it has been taken on by a developer whose taste and skills I trust. I forget why I grudgingly switched back to Across Lite. I might be because I actually print my NY Times puzzles most of the time. I like the option Across Lite has for placing the grid in the lower right corner, so I can see the clues while I am filling in answers. It’s a technique for solving puzzles quickly — looking up at the next clue while your hand is writing — and it’s easier if your hand isn’t covering any clues. I don’t remember if MacXword had the same option. Daniel, I assume you’ve seen “Word Play.” Are you going to go to the tournament in Stamford this weekend? Maybe you could make some sales there? I’ve toyed with the idea of going over the years, just for fun, and maybe as something to blog about. I thought I might go this year; I wish I had gone before, so I could compare it before and after the movie. P.S. I actually submitted a couple of puzzles to the NY Times many years ago. To give you an idea how long ago, I received a polite handwritten rejection letter from Eugene T. Maleska! I should really try to find the puzzles and the letter. The idea of printing the grid in the lower right (or left for lefties I guess) is good … I am going to be revisiting the printing functionality to make it even better. I think AcrossLite does have some superior behavior in that area (about the only area!). One thing that bugs me about the Across Lite printing is that it takes forever. True, I only print once a day, and it’s only a few seconds, but it drive me nuts that after hitting Command-P I have to hit Return three times, each with just enough delay to bug me. Anybody know if there’s a Spotlight plugin for indexing Across Lite files? Andy I believe you’ll find that Black Ink has one. Unless Daniel has changed it from the one I wrote it will only index puzzle title, author, and copyright. Maybe that wouldn’t be possible or desirable for puzzles where the solution requires a key to unlock the solution, but the clues could still be indexable. Thanks, by the way, for writing MacXword. It bugged me when Across Lite required Classic for so long, and the interface was always ugly. I hope to be converted back to Black Ink! Andy – I didn’t really touch the Spotlight importer since Stephan wrote it, but I think it makes sense to index the clues & answers, too. You should change the Red Sweater logo to use squares instead of circles. I just wanted to reiterate what others have already said. Great Icon! It really is wonderful. Something I’d be proud to have in my dock! I’m not much of a crossword puzzler, but I’ll be recommending this to a few friends. Thanks again for making some great software! Whee! My mom and I have been using MacXword for many years, for the NYTimes crosswords online. Very pleased to find out that you’re in charge of the successor! How fun that you’re now in charge of the product we’ll use in future!